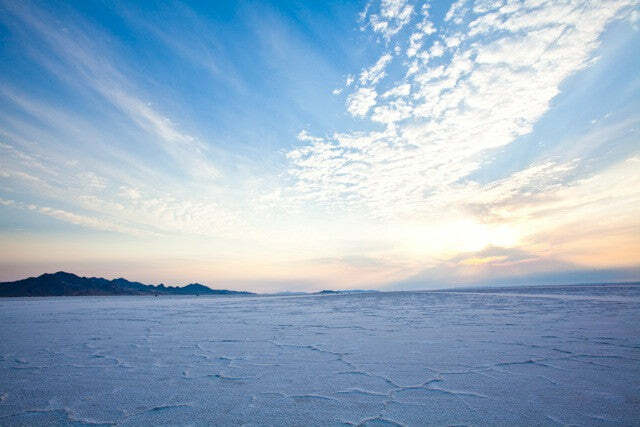 Bonneville is a place where land speed records are made. 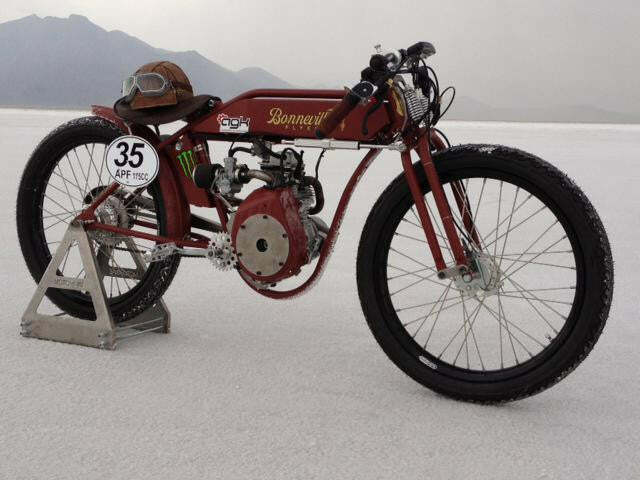 Most people have heard of Bonneville even if they have no interest in motorsports. Our customer, Gunther Maier had been to the land speed event several times and decided it was time for him to make an attempt at a record. After much research and careful consideration Gunther decided to enter a motor bike as his racing machine. The next step was to choose a class and pick a team to help put it all together. 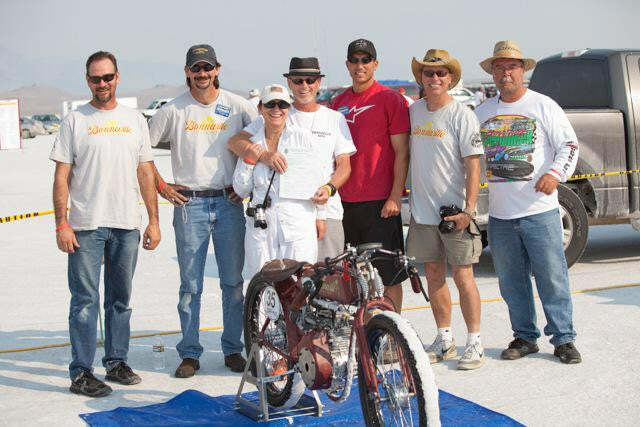 Gunther contacted Pat from Sportsman Flyer to discuss the possibility of building a custom bike to run at the 2012 Speed Week event in Bonneville. Pat accepted the project and immediately put some of his ideas into motion to create a limited edition Bonneville series of bikes. These bikes would have a longer wheel base than his popular Sportsman 200 as well as a lower rider position, thicker wall tubing, custom built forks and several other special details to meet the rules and the demands of the salt. With the new Bonneville chassis in the works it was time to focus on the engine. Gunther decided to enter a 175cc pushrod class. Here at AGK we build the engines for Pat's Sportsman 200 models so Gunther contacted us and asked if we would build an engine for the 175cc class. We've always wanted to go to Bonneville so we quickly accepted the challenge. We knew this wouldn't be our average engine build considering Bonneville is at a high elevation, temperatures are usually very high during Speed Week and this engine would have to run at high rpm on the three mile course. We did our research and built a strong engine using a Honda GX160. After several months of build time the Bonneville Flyer was complete and ready for the salt. There was a lot of communication between our team and the tech inspectors at Bonneville prior to the event. We had to make sure the bike was going to be legal to race so we could make an honest attempt at the current record in the 175cc APF class. When we arrived on the salt in UT the first stop was tech inspection. Fortunately the bike passed without any big issues. 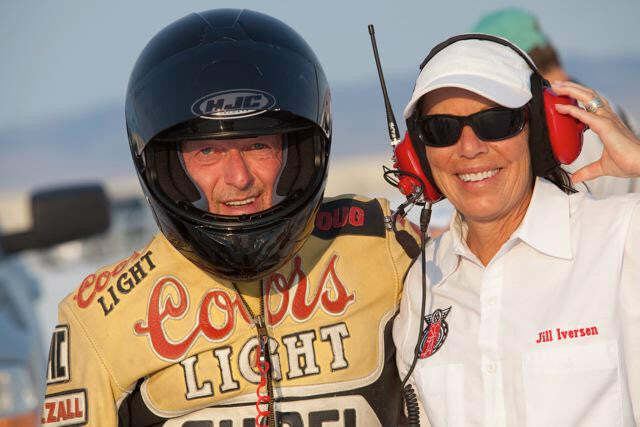 Next up Gunther had to make a rookie pass in order to be certified to race at Bonneville. The rookie pass went smooth so it was time to make our first attempt at a record. The standing record in the 175cc APF class was 64mph. 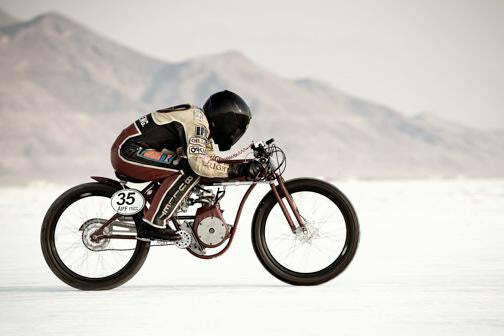 On our first attempt the Bonneville Flyer went 69mph and broke the record. Once you break a record you are required to take your time slip and your racing machine to impound where you are not allowed to touch it. The Bonneville Flyer stayed in impound until the next morning where we were required to run again in order to establish a record. With Gunther in the saddle the bike went 69mph again which set a new record for the class. Now the bike had to go back to impound where the tech inspectors can check the engine and verify it is legal for our class. The engine passed tech and we were now the new record holders for the 175cc APF class! After some tuning we managed to break our own record two more times. We ended up leaving Speed Week with a new record of 73.526mph. We were all happy our trip to Bonneville was so successful. Pat and his team from Sportsman Flyer did a fantastic job building the chassis making sure it met all the rules while still maintaining that early 1900's boardtracker look. Here at AGK we were excited our GX160 ran flawlessly with even more potential left in it. Gunther was thrilled all the time and money he put into this project paid off with him being a new land speed record holder! 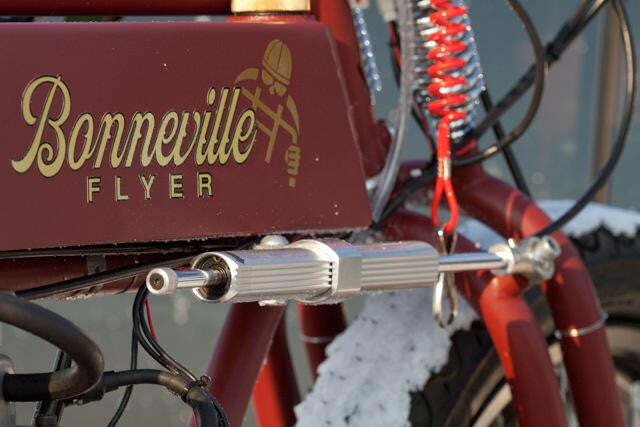 During the week long event the Bonneville Flyer received a lot of attention. Pat is a skilled craftsman and his bikes are a true testament to his ability. Several publications asked to use the bike in their photo shoots. So look for us at Speed Week next year. We are already talking about bringing multiple bikes and racing in various classes!